UTICA, N.Y. — After years of planning, the Utica Harbor Point Development Corporation (UHPDC) and City of Utica Mayor Robert M. Palmieri marked the beginning of a $6.7 million project to replace the harbor walls (bulkheads) at Harbor Point in Utica. The existing bulkheads, originally constructed in 1915, were in disrepair and their replacement represents the latest step in the work of the Utica Harbor Point Redevelopment Plan, which was finalized in 2014. This UHPDC project was awarded a $6 million grant through Governor Cuomo’s Upstate Revitalization Initiative (URI) by the Mohawk Valley Regional Economic Development Council in November. The new bulkheads will provide a safe and stable structure for waterside activities. Floating docks are envisioned in the future to allow boats to visit the harbor after its redevelopment. The new bulkheads are expected to be in place by June, but site restoration activities may extend through the summer. “This important project will help ensure that the redevelopment of the Utica Harbor can serve as a catalyst for economic growth in the region and attract more New Yorkers to experience the Canal System and experience why downtown Utica is a great place to live, work and play,” said New York State Canal Corporation Director Brian U. Stratton. In 2013, the City of Utica began a planning and design process to redevelop the City’s inner harbor. Led by the Utica Harbor Point Development Corporation, in collaboration with City staff, private property owners, state agencies and City residents, a Harbor Point Master Plan was developed. The plan calls for creating a mixed-use destination attraction for Utica that enhances the existing water’s edge with public and private investments. In 2017, the Barge Canal was designated as National Historic Landmark by the National Park Service, which can help promote Utica Harbor as a heritage tourism destination. The Harbor Master Plan includes the preservation and reuse of two buildings on the site constructed in 1917 and 1933. For more information or to review project documents, visit www.uticaharborpoint.org. Empire State Development (ESD) today announced a $6 million Upstate Revitalization Initiative (URI) grant to repair the bulkheads at Harbor Point in Utica, Oneida County. The bulkheads are crucial to the structural integrity of the harbor walls and represent the latest step in the work of the Utica Harbor Point Redevelopment Plan, which was finalized in 2014. The project also includes improvements to the marina and the overall site, and an initial phase of private mixed-use development. As part of the Harbor Point redevelopment, the City of Utica and the Harbor Point Local Development Corporation requested funds to assist with the reconstruction of the harbor bulkheads. Repairing the bulkheads is one of several interconnected components of the overall redevelopment of the Utica Harbor. The Plan establishes a modern vision for the harbor by revitalizing the area to create an economically sustainable multi-use development that will become a premier waterfront destination in the City of Utica. The new bulkheads will provide a safe and stable structure for visiting vessels to dock and to attach floating dock structures. In 2015, the state launched a URI competition to strategically focus on the economic development of Upstate NY as part of long-term, regionally-based plans for economic growth through its 10 Regional Economic Development Councils (REDCs). The REDCs have changed the way NYS invests state resources, through a community-based, bottom-up approach designed to meet each region’s needs, involving private-public partnerships of local experts and stakeholders. Through a competitive process for state resources, the Consolidated Funding Application (CFA), the REDCs create strategies for growth through projects and initiatives that attract private investment and create jobs. The Mohawk Valley received $50 million to implement its strategic plans. “The Utica Harbor Point Development Corporation (UHPDC) has been working alongside our State partners to redevelop Utica’s Harbor Point into a landmark destination for our region,” said UHPDC President Vincent J. Gilroy, Jr. “Our engineering and construction teams have already commenced work to re-grade the DSA-1 site and prepare it for the coming development. This news enables us to keep momentum as we turn our attention to the lynchpin of the project — repairing the Harbor walls so that the site remains an attractive, mixed-use waterfront destination for years to come. UTICA, N.Y. — City of Utica Mayor Robert M. Palmieri and Utica Harbor Point Development Corporation (UHPDC) Chairman Vincent J. Gilroy, Jr. proudly announce that the UHPDC has acquired the first of two parcels of land from the Canal Corporation, marking another milestone in the advancement of this critical redevelopment project. This approximately 17-acre parcel of land, known as Dredge Spoils Area No. 1 or “DSA-1,” was the location of the New York State Canal Corporation’s dredge spoil operations; the location where sediment from the annual dredging of the canal is deposited. In May, the UHPDC released a request for proposals for the development of a 17+-acre portion on the northeast edge of the Harbor Point site. Developer proposals are due by 5 p.m. on Sept. 28, 2018. Based on a market demand study, the Harbor Point Master Plan calls for a preferred mixed-use project consisting of residential upper floor apartments, with retail and commercial uses and associated parking on the ground floor. The winning proposal will be consistent with the City’s vision for this area as articulated in the Master Plan. The Request for Proposal can be seen on www.uticaharborpoint.com. In addition to this critical land transfer, New York State Office of Parks, Recreation and Historic Preservation, the NY Empire State Development, the City of Utica, and the UHPDC have entered into an agreement that will preserve two historical buildings along the Harbor. When the second Canal Corporation parcel is conveyed these two buildings will be reused as local food, beverage, arts businesses and marina support services. For more information or to review the request for proposals and other project documents, visit www.uticaharborpoint.org. In 2013, the City of Utica began a planning and design process to redevelop the City’s inner harbor. Led by the Utica Harbor Point Development Corporation, in collaboration with City staff, private property owners, state agencies and City residents, a Harbor Point Master Plan was developed. The plan calls for creating a mixed-use destination attraction for Utica that enhances the existing water’s edge with public and private investments. The plan realizes the goals defined in the City’s Master Plan (2011), as well as those identified in the Brownfield Opportunity Area Study (2014) and the Local Waterfront Access Plan (2011). 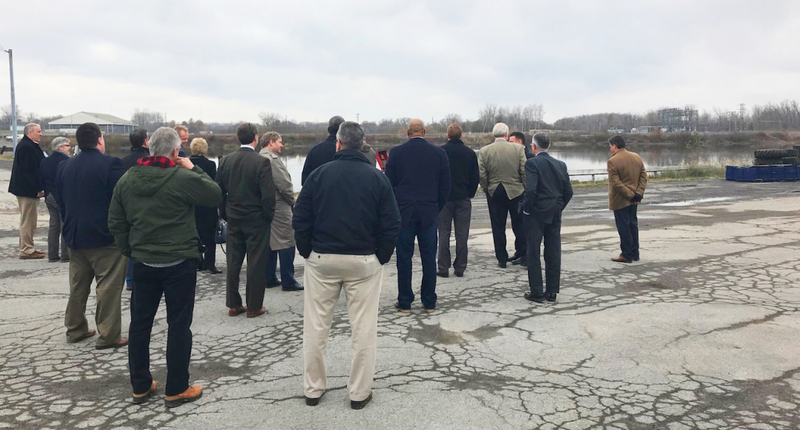 UTICA, N.Y. — City of Utica Mayor Robert M. Palmieri and Utica Harbor Point Development Corporation (UHPDC) Chairman Vincent J. Gilroy, Jr. announce the release of a request for proposals to develop a 17+-acre site on the northeast edge of Utica’s Harbor Point. Based on market demand, the Harbor Point Master Plan calls for a preferred mixed-use project consisting of residential upper floor apartments, with retail and commercial uses and associated parking on the ground floor. The winning proposal will be consistent with the City’s vision for this area as articulated in the Master Plan. The UHPDC hosted a special forum last fall to showcase the Harbor to potential developers. The event, which included developers from across the state, featured a presentation of site details, review of the Harbor Point Master Plan and Design Guidelines, local and state incentives overview, and bus tour highlighting exciting development projects and key community assets. In addition, attendees were led on a walking tour to personally explore the Harbor Point area. Proposals are due by 5 p.m. on July 27, 2018. For more information or to review the request for proposals and other project documents, visit www.uticaharborpoint.org. In 2013, the City of Utica began a planning and design process to redevelop the City’s inner harbor. Led by the Utica Harbor Point Development Corporation, in collaboration with City staff, private property owners, state agencies and City residents, a Harbor Point Master Plan was developed. The plan calls for creating a mixed-use destination attraction for Utica that enhances the existing water’s edge with public and private investments. The plan realizes the goals defined in the City’s Master Plan (2011), as well as those identified in the Brownfield Opportunity Area Study (2014) and the Local Waterfront Access Plan (2011). 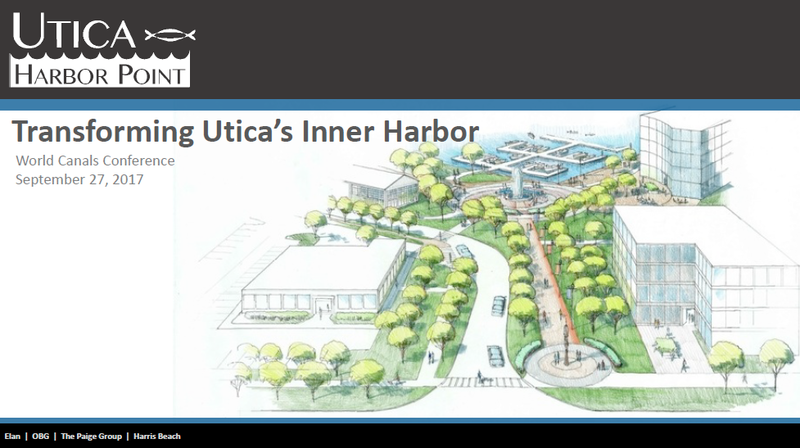 UTICA, N.Y. — The Utica Harbor Point Development Corporation (UHPDC) hosted a special forum Tuesday to showcase the Harbor to potential developers. The event, which included developers from across the state, featured a presentation of site details, review of the Harbor Point Master Plan and Design Guidelines, local and state incentives overview, and bus tour highlighting exciting development projects and key community assets. In addition, attendees were led on a walking tour to personally explore the Harbor Point area. Following this event, interested developers will be invited to complete a Request for Proposal for development of the approximately 16-acre parcel known as DSA-1. UHPDC board members will review the proposals and select the submission that most closely aligns with the vision outline within the Harbor Point Master Plan. In 2013, the City of Utica began a planning and design process to redevelop the City’s inner harbor. Led by the Utica Harbor Point Development Corporation, in collaboration with City staff, private property owners, state agencies and City residents, a Harbor Point Master Plan was developed. The plan calls for creating a mixed-use destination attraction for Utica that enhances the existing water’s edge with public and private investments. The plan realizes the goals defined in the City’s Master Plan (2011), as well as those identified in the Brownfield Opportunity Area Study (2014) and the Local Waterfront Access Plan (2011). For more information or to review project documents, visit www.uticaharborpoint.org. The Utica Harbor Point Development Corporation (UHPDC) will host a special forum on Tuesday, November 14 to showcase the Harbor Point area to potential developers. RSVP by November 10 to rsvp@harrisbeach.com. 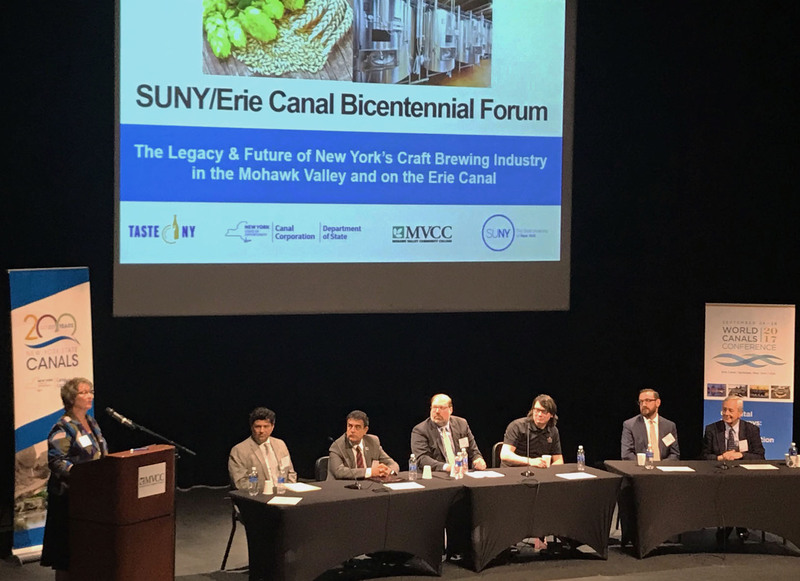 UTICA, N.Y. — City of Utica Mayor Robert M. Palmieri shared insights on Utica’s Harbor Point Redevelopment Project at the SUNY/Erie Canal Bicentennial Forum on October 30 at Mohawk Valley Community College, Utica, N.Y.
SYRACUSE, N.Y. — Utica’s Harbor Point Redevelopment Project was featured at the World Canals Conference on September 27 in Syracuse, N.Y. Project team members Paul Romano, OBG, and Lisa Nagle, Elan Planning, Design & Landscape Architecture, presented Transforming Utica’s Inner Harbor. 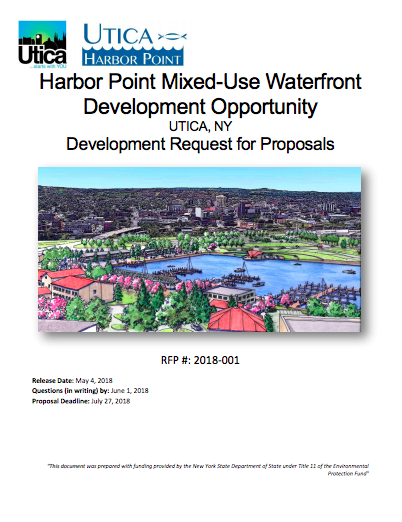 UTICA, N.Y. — The Utica Harbor Point Development Corporation (UHPDC) has released the design guidelines for the Utica Harbor Point Redevelopment Project. The guidelines, available for review at uticaharborpoint.org, are applicable within the PD-E Planned Development–Extraordinary district, for the district located at the Utica Harbor only. The Utica Harbor district is bound by North Genesee Street to the east, the railroad track to the south, Interstate 790 to the west and the Mohawk River to the north. (6) Maintains consistency with the goals and policies of the Harbor Point Redevelopment Plan. The City of Utica Planning Board will review the design guidelines at their Dec. 21 meeting at 4:30 p.m. at Utica City Hall, and is expected to conduct the required public hearing on the guidelines at their meeting on Jan. 18. The Planning Board must then make a recommendation to the Common Council. Following the recommendation, the City of Utica Common Council will review the guidelines and conduct its own required public hearing before considering their adoption. In 2013, the City of Utica began a planning and design process to redevelop the City’s inner harbor. Led by the Utica Harbor Point Development Corporation, in collaboration with City staff, private property owners, state agencies, and City residents, a Harbor Point Master Plan was developed. The plan calls for creating a mixed-use destination attraction for Utica that enhances the existing water’s edge with public and private investments. The plan realizes the goals defined in the City’s Master Plan (2011), as well as those identified in the Brownfield Opportunity Area Study (2014) and the Local Waterfront Access Plan (2011). To review project documents, including the Final GEIS, please visit www.uticaharborpoint.org. UTICA, N.Y. — The Utica Harbor Point Development Corporation (UHPDC) announced today the addition of four new members to the UHPDC board. In addition, a voting seat on the UHPDC board will now be occupied by the councilperson representing the district that encompasses Harbor Point. Edward Bucciero, Patrick Donovan, Joseph Johnson and Christopher Salatino have completed their duties with the board. “I want to thank all board members, especially Ed, Pat, Joe and Chris, for providing invaluable input that has helped us advance this critical project to such a positive place,” said Gilroy. The UHPDC Board of Directors is responsible for the operation and management of the public authority through strategic input, guidance, oversight, mission authorization, policy setting and validation of the authority’s mission, measurements and results. The Mayor of the City of Utica is the sole member of the public authority and is responsible for the appointment of members to the board of directors. UTICA, N.Y. — The Utica Harbor Point Development Corporation (UHPDC) presented on Tuesday the results of the recently completed Draft Generic Environmental Impact Statement (DGEIS) for the Utica Harbor Point Master Plan. Developers will be able to build upon the information within the final GEIS to design a project that will not only support long-term community and economic benefits, but is also appropriate for the environment. New York’s State’s Environmental Quality Review Act (SEQRA) requires the preparation of an Environmental Impact Statement (EIS) for development where there might be a significant adverse environmental impact. In 2013, the City of Utica began a planning and design process to redevelop the City’s inner harbor. Led by the Utica Harbor Point Development Corporation, in collaboration with City staff, private property owners, state agencies, and City residents, a Harbor Point Master Plan was developed. The plan calls for creating a mixed-use destination attraction for Utica that enhances the existing water’s edge with public and private investments. The plan realizes the goals defined in the City’s Master Plan (2011), as well as those identified in the Brownfield Opportunity Area Study (2014) and the Local Waterfront Access Plan (2011). To review the documents, including the DGEIS, please visit www.uticaharborpoint.org. Questions regarding the public meeting may be referred to Brian Thomas, City of Utica, Commissioner of Urban and Economic Development, at 792‐0181. Public comment on the DGEIS will be received until Sept. 28 by contacting Thomas or visiting www.uticaharborpoint.org. UTICA, N.Y. — Residents and business owners are invited to attend a meeting on Tuesday, Sept. 15, 2015, to comment on the Draft Generic Environmental Impact Statement (DGEIS) for the Utica Harbor Point Master Plan. The meeting will be held from 6-8 p.m. at the North Utica Senior Center, located at 50 Riverside Drive, Utica. The primary goal of the GEIS is to evaluate potentially significant adverse impacts related to the implementation of the Utica Harbor Master Plan. This document is integral to informed decision-making and planning for success. Typically, each developer would be responsible for conducting its own surveys and research, which has now been already completed through the GEIS process. By completing a GEIS, the UHPDC has improved the project’s build-ready status and compiled information necessary to promote and guide the fulfillment of project objectives. In 2013, the City of Utica began a planning and design process to redevelop the City’s inner harbor. Led by the Utica Harbor Point Development Corporation, in collaboration with City staff, private property owners, state agencies and City residents, a Harbor Point Master Plan was developed. The plan calls for creating a mixed-use destination attraction for Utica that enhances the existing waters’ edge with public and private investments. The plan realizes the goals defined in the City’s Master Plan (2011), as well as those identified in the Brownfield Opportunity Area (BOA) Study (2014) and the Local Waterfront Access Plan (2011). To review the documents, including the DGEIS, please visit www.uticaharborpoint.org. Mayor Palmieri and UHPDC Chairman Vin Gilroy today announced that 105 Genesee Street, a building located at the forefront of the Utica Harbor, will undergo demolition marking another milestone in a catalyst project of the City’s Comprehensive Master Plan for Revitalization. The demolition will enable the City of Utica’s once hidden Harbor Point to be on full display. The development of the Utica Harbor is a priority project for the Mohawk Valley Regional Economic Development Council (MVREDC) and has received millions of dollars in funding from Empire State Development and the Department of State. “While significant achievements have been made behind the scenes, public excitement about this area’s potential continues to grow as we see physical and tangible progress at Harbor Point,“ said Vincent J. Gilroy, Jr., Chairman of the Utica Harbor Point Development Corporation (UHPDC). The UHPDC is currently in the process of completing a Draft Generic Environmental Impact Statement (DGEIS) that will evaluate potential environmental and socio-economic impacts associated with the Utica Harbor Point Master Plan. To review the Scoping Document, which outlines the various components of the DGEIS, click here. Harbor Point has been an important area of Utica for almost 100 years. In 2008, New York State legislation allowed for the transfer of approximately 20 acres of land to the UHPDC. Based upon the City of Utica Master Plan, Utica secured $250,000 in funding from the New York Department of State for development of a Master Plan specific to Harbor Point. The UHPDC, City of Utica, and a consultant team led by Elan Planning, Design, and Landscape Architecture, PLLC have developed this plan to reinvigorate the City’s waterfront at Harbor Point. The Master Plan was advanced in December 2013 when Utica received grants through the New York State Regional Economic Development Council (NYSREDC) totaling $5.5 million. The NYSREDC awarded an additional $750,000 for infrastructure improvements at the Harbor in its most recent round of funding. Questions regarding the project may be referred to Brian Thomas, City of Utica, Commissioner of Urban and Economic Development, at 792-0181.